As such, corporate headquarters – through cohesive, consistent branding – can create a verve; a renewed energy, innovation and authenticity through a brand expression seen throughout the physical environment. Your company is more than a brick-and-mortar space; it’s a canvas. It’s an opportunity to cultivate and reinforce your brand’s story. It clearly and acutely communicates your brand’s identity to your most valuable asset, your employees, as well as partners and clients who enter your building. Here are just a few opportunities to enhance your corporate brand and culture with complex graphics and design. With your company’s logo and colors on glass or on the façade of the building, doors, and more, you take the first step in creating a visual brand expression. Brand your corporate environment with attractive and affordable wall graphics and murals in break rooms, conference rooms, and hallways to strengthen your brand and culture. 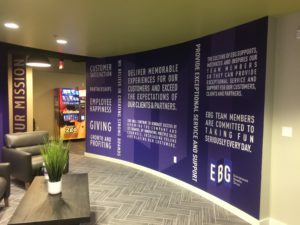 From perforated decals to static clings, to etched graphics, to visual magnetic graphics, graphics and decals are powerful, long-lasting branding opportunities. Select a reception area or recognition wall that is unique or prominent to make a brand statement that enhances the architecture and culture identity of your corporate space. Multidimensional and/or custom lighted pieces are a perfect solution for this space. 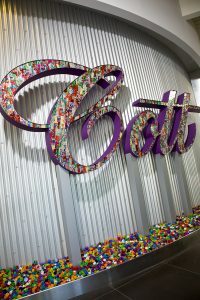 Opt for custom lettering, numbers, and colors to create a uniquely branded experience as you guide people throughout your space. Room signs and common area signs to cubicle signs all tying back to the graphics and statement pieces for a complete visual brand environment. A bit of a misnomer, ‘complex’ graphics are anything but. In fact, you can create unique, authentic graphics on countless materials in an eco-friendly, cost-effective way. For example, flatbed printing uses UV inks which are cured into a solid film once exposed to wavelengths of UV light that tightly bonds directly onto a substrate, providing the ability to print on multiple substrates that don’t need pre-preparation for size or shape beyond the parameters of the overall size of the bed. Another step in the printing process, computer numeric control (CNC) machining with camera-vision finishing – provides a streamlined process for print and cutting applications which also boasts the ability for router and laser cutters to use photovision and registration point recognition to print and cut full sheets of nested objects. CNC machines utilize computer numerical control over tools like lathes, routers, grinders or mills by using specialized software that enables precise control of coordination, feed rate, location, speed and more. For the signage industry, this means that for signs that require large amounts of metal and plastic parts, often in complex shapes, this machine’s multiple axes can adjust to difficult angles and help manage hard-to-cut materials. Such printers and machines can bring the most complex graphic designs to life with the right materials and printing processes with ease. Creative Sign Designs has been providing high-quality interior and exterior signage products to corporate entities for 30 years. Contact us to let the experienced team at Creative Sign Designs guide you through your corporate headquarters project today!